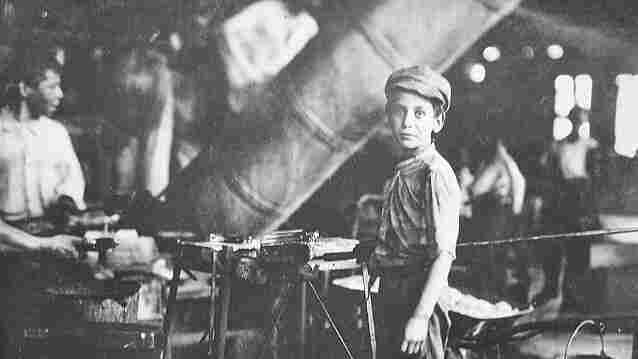 Child Labor In America, 1920 : Planet Money A million kids worked, largely in factories and on farms. Here's a closer look at what the 1920 Census called "Children in Gainful Occupations." So I was looking through an old Census report and I found a chapter entitled "Children in Gainful Occupations." Turns out, about 1 million children age 10 to 15 were working in America in 1920 (out of a total population of 12 million kids in that age range). About half worked on family farms. The rest did everything else, working in factories, trained as apprentices, and served as messengers. As late as 1940, the average American had only a ninth-grade education, and the first enduring, federal child-labor law wasn't passed until 1938. Anyway, here are two graphics showing what a million kids did for work back in 1920.